The annual Christmas celebration combines the street parade, festival and carols concert. Held on the second Sunday in December each year, Christmas in the City invites the Bunbury-Geographe community to celebrate the festive season. It features free activities and entertainment for the whole family. Participants line the streets of the CBD to watch the RAC Street Parade pass by from 5.30pm, then make their way to Graham Bricknell Music Shell to sing along to Christmas carols at The Apprentice and Traineeship Company Carols Concert from 7pm. 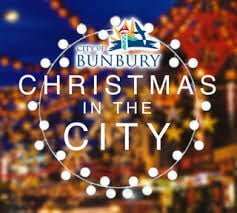 The Christmas in the City Street Parade begins at 5.30pm from the Bunbury Recreation Ground and winds through the streets of the CBD, before ending near the Bunbury Regional Entertainment Centre. There will be road closures in place to accommodate this. Road closures will be in place for the RAC Street Parade from 3pm until 7pm as detailed to the right. The RAC Street Parade map can be viewed here. Please be advised that a number of road closures will be in place for the RAC Street Parade and along Blair Street for the Christmas in the City event. Blair Street will be closed between Symmons Street and Haley Street from 12noon until 9.30pm. Applications for community groups to apply to be included in the Community Candle Competition will be open closer to the event date. To be notified when the competition opens, please email events@bunbury.wa.gov.au with the subject of Community Candle Competition Enquiry and ask to be sent an application form once the competition officially opens. The Christmas in the City map can be viewed here​. Wollaston Lions Train (3-6pm approx. and then after the RAC Street Parade has passed) has a small cost applied due to this being a fundraising venture for the club.